Micheal Keaton confirmed back in February that he’s been talking to Tim Burton about making a sequel to the 1988 film Beetlejuice. There hasn’t been much news since then, but I’m sure the idea is still kicking around. What do you think? Are you interested in a Beetlejuice sequel 27 years after the first? Usually I would say no, but for some reason, I think it could work with Beetle Juice if Tim Burton is behind the wheel. No, I do not like sequels generally -this one however is so many years later -who knows. However I probably would not go and see it as did not really like the first one anyway! Yes! I would love a sequel. 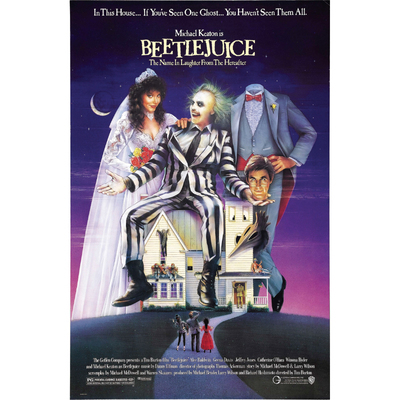 Beetlejuice was easily one of my favourite Tim Burton films but it's been a long time. The idea is exciting, but the execution and practicality of the idea, I'm not so sure about. Second will be more than likely very much a no like too. It's my favourite Tim Burton film but I'm not sure what a sequel would bring to the table. I think Michael Keaton could pull this off as he's be very much covered in make up so wrinkles or aging would be covered but I'm not sure it's begging for a sequel really. What direction should the Spiderman franchise take? Christian Bale to play Steve Jobs, Yay or Nay? Will you be checking out Dracula Untold? Solo A Star Wars Story - Now that we've seen the first teaser, what do you think?